Your marketing funnel is the most practical, efficient way of attracting and keeping the attention of your tribe long enough for them to understand their own needs and whether you can meet them. 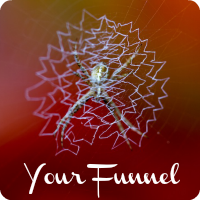 Without a funnel, you waste time and money and your clients struggle to make the decision to buy from you, even if they have a genuine need for your services. CHANNEL – Where does your tribe hangout & spend money? TASTER – What can you offer them that will get them low-risk, high-impact results quickly? HOOK – What will connect them with the pain of their biggest problem and/or their deepest desire? LOOP – How will you maintain contact with them after they have bought from you? As well as creating high value at each step, the aim is to have the infrastructure of your funnel automated online and offline as much as possible to leverage your time and money. 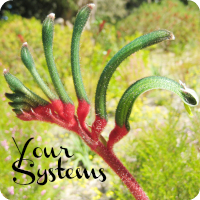 Your systems are designed to link multiple processes together online and offline. The aim is to spend most of your time doing what you do best, ie. sharing your gifts, and allowing the rest to run automatically in the background or have your team manage the tasks they too are best at. CHANNEL – Automating the lead generation process online so that you tribe can act on a clear call-to-action via your chosen channels. TASTER – Using a centralised system to organise your leads’ contact details as well as the source of the lead and level of engagement. HOOK – Allow your tribe to book into your diary to speak with you personally or sign up to an event online and then send reminders to reduce the rate of ‘no-shows’. LOOP – Implement referral systems to automatically pay your referrers a finders fee and offer affiliate programs to have your tribe promote you. You also want to automate your service delivery to make sure you leverage your time and streamline the experience for your clients as much as possible. Listen to the Week 6 Audio [15:06]. The key themes for this week are Funnel, Systems, Goodwill and Building. Download the Marketing Funnel printout and the Growth Cycle printout.